Kamen Raidâ × Sûpâ Sentai × Uchuu Keiji: Supâ Hîrô Taisen Z (2013) - Sci-fi-central.com. Japan  2013  92m   Directed by: Osamu Kaneda.  Starring: Yûma Ishigaki, Junya Ikeda, Arisa Komiya, Shun'ya Shiraishi, Makoto Okunaka, Tasuku Nagase, Junki Tozuka, Yûko Takayama, Hisahiro Ogura, Ryô Ryûsei, Shûsuke Saitô, Yamato Kinjo, Akihisa Shiono.  Music by: Kôtarô Nakagawa, Kôsuke Yamashita. A new evil organization known as Space Shocker, which are led by the magic-using Space Ikadevil and Space Spider Man, threatens the Earth by causing an unknown phenomenon. 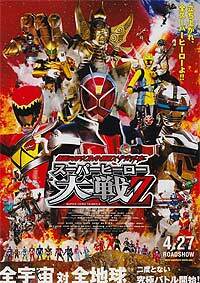 The Space Sheriffs Gavan type-G and Sharivan are sent to execute all wizards on Earth in response to the threat and begins to attack Kamen Riders Wizard and Beast. The Space Crime Syndicate Madou, who were once defeated by the original Sharivan return, to cause even more havoc in the world. During this, Yoko finds a mysterious little robot called Psycholon which Space Shocker and the Madou are after.